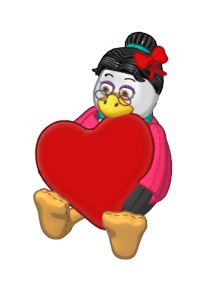 Keep working on Valentines Day prizes – collect hearts, candies from the park, & Valentines Gifts on Thursday! 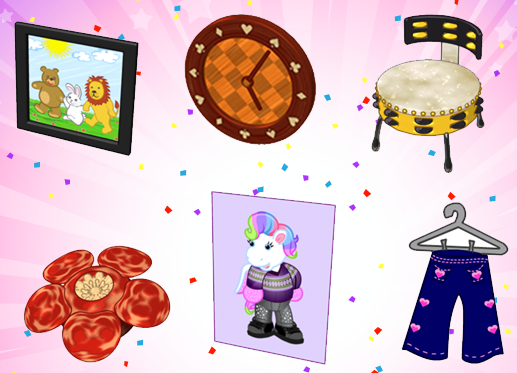 Collect Baked Goods from the very first Bake Sale in Webkinz World and combine them on a stove for prizes. Click here for detailed “recipes”. 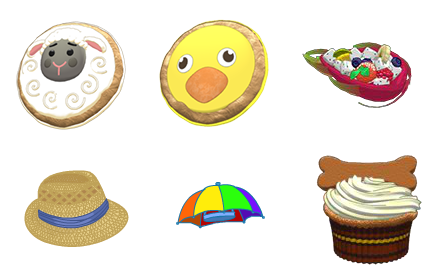 The first time you log into Webkinz World during this event, you’ll be awarded a Bake Sale Cookbook. This month’s Player Appreciation Day falls on February 17. The new Player Appreciation Gift is the Clover Rug from Ganz eStore. The Clover Rug offers four different patterns – rotate it in your pet’s room to see all four looks. This item is not tradeable or sellable. 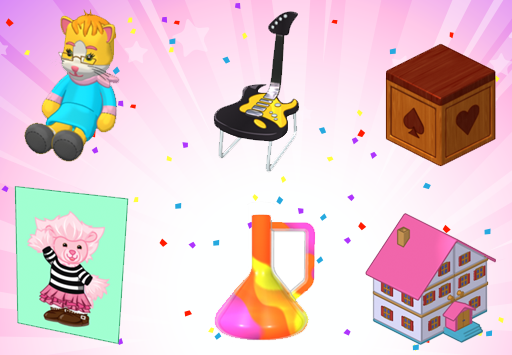 If you would like to add it to your Webkinz account, log in to Webkinz.com (web only) on February 17, visit Today’s Activities, and click to collect your gift. dee – how is your dh feeling? I’ve been getting Bad Gateway 502 error messages too. Refreshing helps me limp through PAN, but it takes 3x as long! Sometimes it takes 10 pages before I see Lovestruck Panda! i had the red version of the sweetheart bed in my room for a bit…just not what wanted either……what about that sparkly pinkish one, i believe it is a superbed…..
you would think they would have just a four poster bed…..
No, but the Queen of Hearts bed sure would. Dee, my feeder is almost like yours. I bought it cheap last year..gonna try it fir the first time this year. When do you put it out? Well, I got pretty lucky with the packs of ww cards I got at dollar tree! I got a free pet! Just a koala.but free is free! Puma, I’ve been getting those messages alot too…takes forever to get stuff done..ugh! I thought I might have picked up a virus on my phone..
any word on how many monkey points we need for the next trophy? and my feeder gets one cup water to 1/4 cup sugar,,,,,,,,i stir it up till sugar dissolves and put in the feeder. i clean the feeder every time i fill it…….mostly just super hot water and a paper towel if necessary to wipe the rim etc the well meaning peeps have bought me pretty ones in the past, but there is no way to get into all those crannies to clean it in a resonable amount of time. my h birds just hang out and wait for me to bring the newly filled feeder out……….they get hangry! For all you dog lovers…. The Westminster Dog Show at Madison Square Garden in on tonight at 8pm and again tomorrow night ! dee – i love that your hummingbirds wait for you to clean & fill the feeder! gaga – hi! westminster is fun to watch! CHANT – reading about your room made me think about a bed I saw the other day – check your email!!! Lol@ dee playing a live angry birds game..that’s so cute! Umm moms, I think you might have meant it for pumas luv shack??? Rainy sloppy day here today… after snowfall yesterday ! Puma .. if you decide which bed you need to complete your room .. let us know! 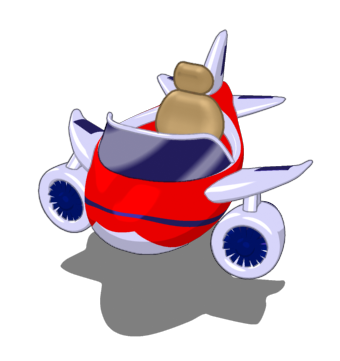 RubyCubes… How are things going in your RL ? How is your new job ?? daughter doing well ? Wondering how you all are doing with Medallions ?? The most I have collected for my targeted pet is 23… Not sure I will ever get it !! I’ll check my medallions in a bit. I’m having such LAG getting anywhere in magical forest. Not typical for me with exception to Magic Mire, which always lags. As far as the floating medallion…I missed clicking on mine today because I was feeding the cat and I couldn’t get to PC in time. Hoping it floats by again while I’m on my account. Ha ha! The floating medallion came soon after I submitted last comment! Checked my medallions. Not sure which pet I’m targeting, but these pets (other than snowy retriever with extra 30 after adopting one) have more than 20. Blossom Fish & Raccutie with 28 each and Tuxedo Cat with 24. Ruby, I admire your daughter for standing up for herself and owning her personal power ♥ And I’m glad your new job is working out so well, you definitely deserve it. Hugs! And thank you all for the new codes! The Sweetheart Sink is really pretty. Hey, Cassie! You have mail Nothing needed in return, hugs! Sophie’s Rewards sound interesting – I’m looking forward to getting the inside scoop on them, too! 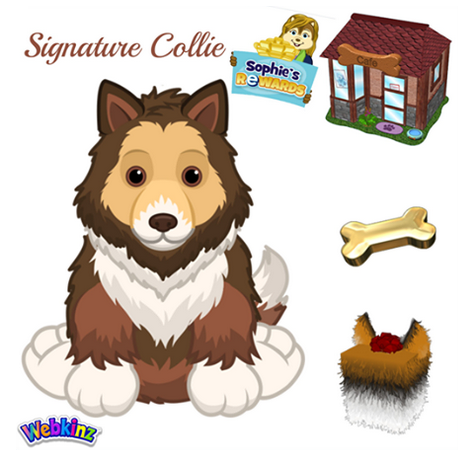 That Signature Collie sure is cute – gagagee, it must be new! I wasn’t able to dig anything up on it, either. cwc, I hope you’re feeling better today! And to the thoughtful person who surprised me with a Pink Cheesecake Truffle Tree, thank you SO much! That was so generous of you! It’s such a beautiful tree, and it dispenses Pink CHEESEcake Truffles to boot I just love it ♥ Hugs! Mist, congratulations on your Pinstripe Jacket with Coattails making it to the finals of the Clothing Design Contest! It’s such an elegant and sophisticated design. Hugs, and good luck! Hello everyone! Haven’t been on in a long time but thought I’d look at everyone’s wishlist to see if I could send some gifts for Valentine’s day! Gaga- I was in trading room hoping to trade for a “Sweetheart Castle” and traded for a “Millie’s Sandbox” ! I will send it to you if your still looking for one! Cheese-Thank you again for the awesome and unexpected gifts! I love them! It’s ok moms! Lol its ok to be 2 cupcakes short lmbo. I didn’t find anything in my ww mail, so I hope you sent to right person. .I would have sent it back to you if I’d gotten it. 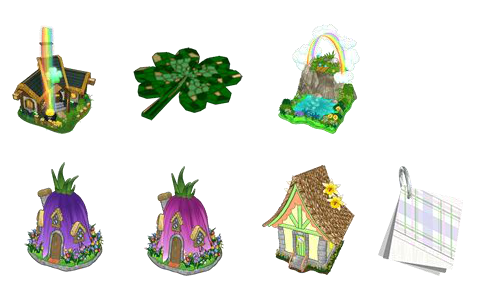 Btw, that shamrock rug looks interesting! Can’t wait to see what it looks like in a room. So we have to get up early in morning to go see the dr. 830am..ugh!!! Poor hubby has been coughing for couple days and he can’t seem to shake this upper respiratory. Then I started coughing last night..so not fun. So off to the dr we go..again. I need to stop getting sick so I can get my gall bladder out! Hopefully my car doors won’t be frozen in morning..the sleet was pretty bad when I was driving home couple hours ago, it was sticking to my wiper blades and clumping up! I had to pull off road 2 times to clean them off so wipers could work right! We are having some strange weather. First it snowed, then it turned to sleet..then its,supposed to rain on top of that..hope it does rain and washes all the snow and ice away..anyone else having weird weather? gotta run, have little house on the prairie on pause and i just heard dh come in!!!!!!!!!!!!!!!!!!!!! Emma…Oh my Gosh… I would love Millie’s Sandbox !!! Will check your list to see what I can send in return… Thank you ! Gaga- Awesome…I’m sending it now! I don’t have a list but if you have a Sweetheart Castle that would be great but no need to send anything! Enjoy! I ended up choosing the Red Velvet Rose Bed from the eStore- and it was on sale, so woo. It’s the closest I could find to what I was looking for. Gradually puttering on the LuvShack, and trying to unabashedly copy the Chef’s Kitchen that featured on WKN as closely as I can manage. Such a great looking room!! Jose the Drywall Guy came these past 2 days and painted the bathroom and kitchen- we’re getting closer every day! Vanity in the bathroom soon, and as soon as the toilet is hooked up, we’ll have a proper downstairs bathroom again! Then all we’ll need it kitchen cabinets, and floors! great minds think alike! i’m glad you got it! a few cupcakes short summarizes my week so far!!! dee – unicorn mask!!!! LOVE!!! Started working on a new valentines room today. 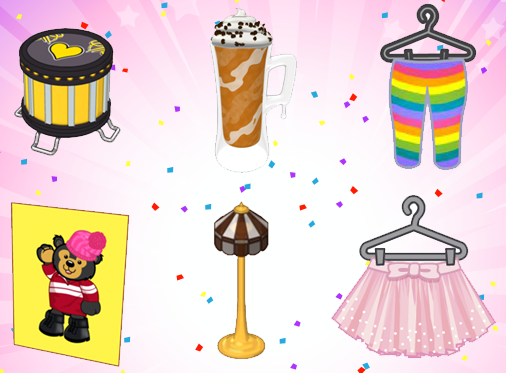 We’ve gotten so many new valentines items this year that I couldn’t fit them in my old room. Weird weather again today. Snow, freezing rain, then regular rain. My car was frozen solid. Lots of schools were closed again. I’m a little jealous, I never got this many snowdays when I was younger. We would have 1-2 days off at most and there were many years that we didn’t have any. Emma .. Thank you so much for Millie’s Sandbox.. It is one of the cutest items I’ve seen in a long time ! Sorry..I don’t have the Sweetheart Castle but please consider a Wishlist ! dee.. hope you have a great day for your rescheduled birthday outing ! Chants.. sorry to hear you and your hubby are both sick… You sure have had more than your share of illness/injury ! Hope things turn around soon ! Poured rain ALL day yesterday.. Very windy… tonight changing to snow ! Does anyone know if today is maintenance day ?? Sophie is still sleeping.. hasn’t released Deluxe Wednesday News yet ! 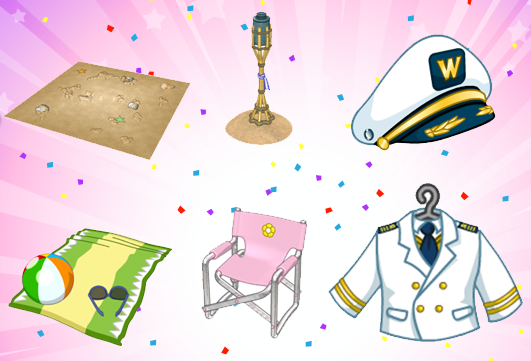 LOTS of NEW stuff on the Vacation Wheel!! That was actually a pretty fast maintenance, it’s all back up already!! WOOHOO, the Dawn Dragon is available for purchse .. but BOOHOO, the LOVENEWPETS promo code is no longer working. Morning Gymbonians, and HAPPY UPDATE WEDNESDAY!!!! Up first is PETS! 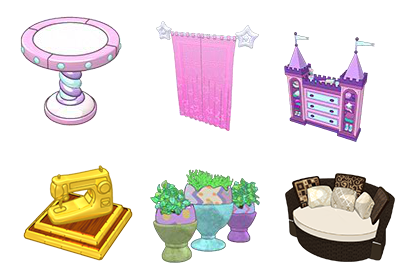 Top row: Lil Purple Spring Unicorn Gift Box, Purple Spring Carousel Cottage, Purple Uni-Cone. 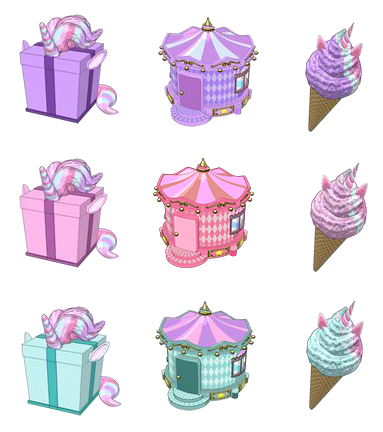 Middle row: Lil Pink Spring Unicorn Gift Box, Pink Spring Carousel Cottage, Pink Uni-Cone. 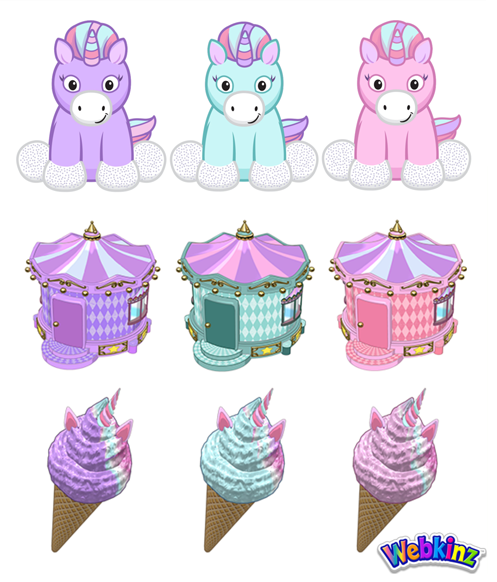 Bottom row: Lil Blue Spring Unicorn Gift Box, Blue Spring Carousel Cottage, Blue Uni-Cone. Been getting a ton of rain here! Just caught up on all the recent posts and trying to stay caught up on all the activities going on in WW world! Seems like every time I go into the clubhouse room to click on the cow or dog for a daily cupcake or chocolate truffle, a pet is always blocking the way. Tried exiting and coming back, but the pets load so fast once I finally get into the room! Anyone have any tips? Also, I’m so mad at myself because I’ve been on top of getting the daily truffle from Cinnamon in the kinzville park all the days except for yesterday where I was so busy that I totally forgot. So now I will be one day away from completing my chocolate collection and winning the grand prize! Hopefully, I’ll be able to find someone who has an extra for trade in the clubhouse because 2000 estore points for one chocolate seems a bit pricey to me! 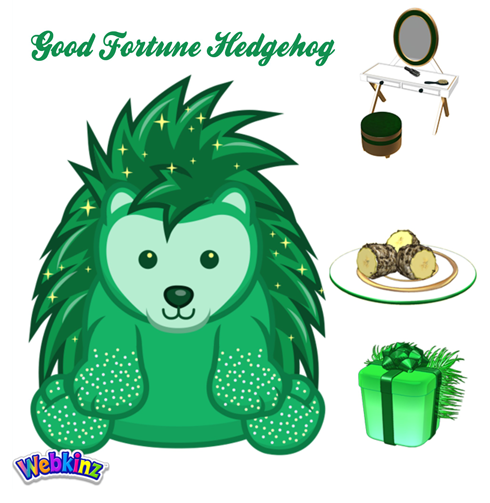 The Good Fortune Hedgehog is meant to tie-in with March’s ?? Box theme, which is not very coincidentally also called Good Fortune! Top row: Good Fortune ?? Box, Good Fortune Wallpaper, Good Fortune Flooring. 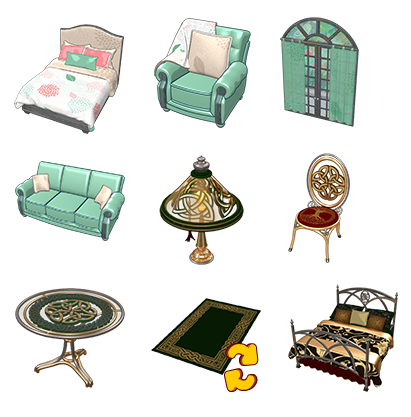 Middle row: Good Fortune Bed, Good Fortune Ottoman, Good Fortune Chair. 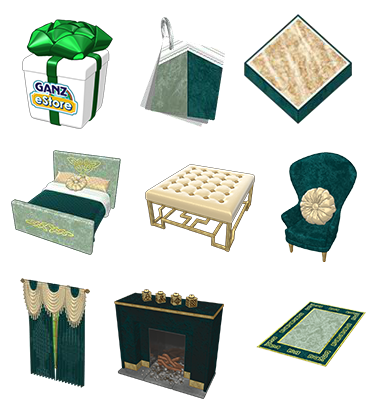 Bottom row: Good Fortune Curtains, Good Fortune Fireplace, Good Fortune Rug. Thanks for the spoilers Lurker! Always look forward to those! Speaking of mystery, here’s some summer mystery, methinks! None of this stuff is named yet, except in my head, where I have named it OMGNEEDSOBADLYHURRYUPSUMMER! I am about dying from the absolute desperate cuteness of the flamingo slippers and I need like three pairs of them! 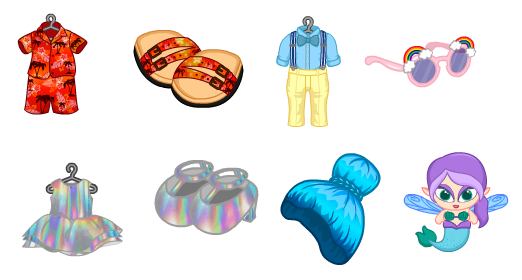 Obviously, the bows are part of the continuing line of birthstone items, which means we will see peridot, sapphire, and opal bows in the fall bags, and topaz, blue zircon, and garnet bows in the Christmas crackers. Ugh, the last post got eaten! Can some kind soul please go and fetch it? Thanks! Anyway, moving on! These look to be the Mother’s Day Gift Bag items. 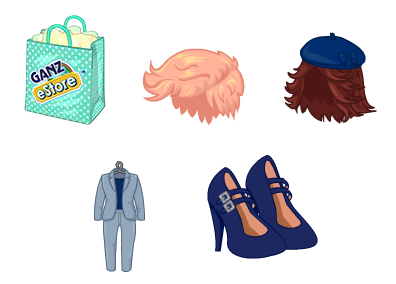 Top row: 2019 Mother’s Day Gift Bag, Short and Sweet Wig, Blue Bow Beret. Bottom row: Powerful Pantsuit, Blue Suede Mary Janes. Moving on to random newness. Top row: Aquamarine Glasses, Forest Tiled Sink, April WKN Gift Box, Diamond Glasses. 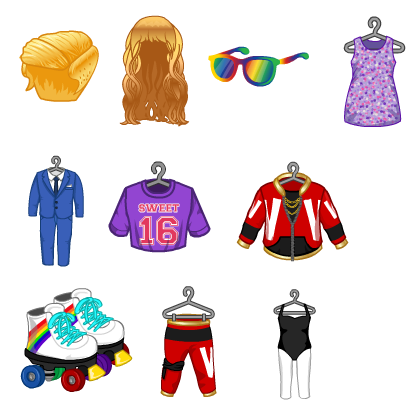 Bottom row: March Deluxe Gift Box, Curly Cute Wig (March Deluxe Clothing), unnamed April Deluxe Clothing which I'm calling the April Showers Headband in my head, Magic W Fountain. 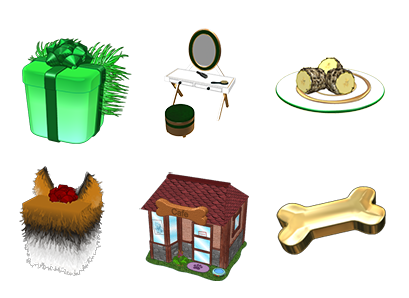 The glasses are the peek-a-newz prizes for March and April respectively, and the Forest Tiled Sink is for the March peek-a-newz. No clue what the Forest theme piece will be for April yet, since neither the name nor the image are in the database! The Magic W Fountain will be given out as February's Deluxe Day prize. Mobile Wheel of WOW: Snore x 2! Vacation Wheel: Snore x 3!!! Well, that is all the information I could ferret out this month, so until next month, this is TheSpoilerLurker signing off. This post will self-destruct in 5…4…3…2…1…BOOM! Thanks for all the info to “TheSpoilerLurker”! The Fashion Week sounds like fun! Not as excited about the bake sale. But I guess it is a good chance for new members to get some items! A big thanks to the person who sent me a valentine gift! Is there no more log out Carnival? I haven’t had it pop up on my accounts today. Maybe someone has mentioned this already. They killed Log Out Carnival!? We’re going to have a sad little almost-three-year-old when he plays with me next time. Lurker, thanks for the spoilers!!! MOMS, could you have sent that bed to any of my other accounts? I have you on all of mine, so I will look later, if I find it I will send it back! I just know it wasn’t on my first account. chant – i sent the code via EMAIL! MUFFIN – i just saw your comment about the chocolate – if you just want the chocolate, i can send it to you, but that will not get you the grand prize unless you pay the estore points!! !